This was originally published on Monday, December 19 ,2016 in the Pacific Daily News. Click here to subscribe to the PDN. It goes without saying that money is of the utmost importance and, if not dealt with in the right way, could land you in a bad financial situation. What you are today and where you want to be tomorrow are the results of all the financial choices you have made in the past. Your mortgage length. The most common mortgage term is 30 years. Many new home owners settle for the 30-year mortgage because the upfront costs are lower. But take some time and really look at your mortgage contract. If you purchased your house with a 30-year mortgage for $250,000 at 8 percent, the total amount you will be paying is $660,000. That is a difference of $410,000 that goes directly to your lender. If you can refinance your home to take advantage of low interest rates, do so, and take a 15-year mortgage instead. If you can’t afford to make higher payments with the 15-year mortgage, try paying half your mortgage every two weeks. At the end of the year you will have made 13 payments instead of 12. By doing this, you can pay your mortgage five to 10 years earlier and save $100,000 or more, depending on your interest rate. Automatic payments. Let’s face it, life is hectic enough. You don’t need to run to the bank to deposit paychecks or run errands at lunch time to pay bills. By automating your finances, you can save time, fuel and the expenses of late fees if you forget to pay your bill on time. Create an automatic payroll deduction with your employer to your checking or savings account so that you ensure you are paid first. Financial institutions make it easy to pay bills or credit cards on line with their online bill-paying services. Not monitoring your credit score/report. Your credit score and report are important because these two items essentially tell potential lenders how well you handle your money. If you are purchasing a home, your credit rating is considered in determining your loan interest rate, and the difference between a poor credit rating and a good rating can be enormous. With a good score, you are offered lower interest rates, which in the end can save you thousands of dollars and sometimes even hundreds of thousands of dollars. Future employers can also look at your score and use it to determine how dependable you are. To keep a good score, pay your credit cards and other debts on time. A good rule of thumb is to use 10 percent to 30 percent of the credit available to you. Check your credit report and score for free three times a year and dispute any odd accounts or mistakes on your report. Not having a will or trust. We never want to think about passing, but not having a will or trust can cause some serious financial issues for your loved ones. Even though you feel that you do not have enough assets or money to pass on, what you do have should stay with your family. A will or trust can also plan for the care of your children upon your death. If a guardian is not named, the state will have to decide who will provide care for your children. Protect your family and your estate by having a will or a trust. Life insurance. Life insurance can assist your family members in covering the cost of your funeral expenses and pay other bills long after you are gone. Not only should you be covered, so should every member of your family. Funerals are expensive no matter how old you are. Life insurance can also help pay for medical bills that may be left behind. This was originally published on Monday, May 30 ,2016 in the Pacific Daily News. Click here to subscribe to the PDN. Q: My husband and I purchased our first home 10 years ago. During this time my husband and I have been fortunate enough to advance in our careers and are making more than what we were when we bought our house. When we purchased our home, mortgage rates were much higher that what they are now. My husband and I want to take advantage of our current situation and are considering paying off our mortgage early. Can you help us decide if paying off our mortgage is beneficial? A: A mortgage is a huge investment that takes a lot of dedication, especially if you purchased your home on a thirty-year plan. Whether you have a shorter fifteen year or a longer thirty-year plan, much can happen between now and paying off your mortgage. Like any large decision, you should weigh the pros and cons and consider where you are in life. Although it may be tempting to live mortgage free, you should consider your other financial goals and your tax situation. Here are some reasons that you may want to hold off on paying your mortgage early. Other debt: If you have other loans or credit cards that charge a higher interest rate than your mortgage, you should consider paying those off first. Interest on debt other than a mortgage is not tax deductible. Maximize retirement: If you aren’t already maximizing your retirement contributions, use the money you would use to pay off your mortgage to increase your contributions. Do this especially if your employer matches a portion of your contributions. If you are close to retiring or if you started your plan later in life, you should take advantage of getting the most out of your plan. Also, your contributions are tax deferred. Emergency fund: Do you have enough money saved up for a rainy day? If not, create an emergency fund. Most experts suggest to save up at least three months of your current income. You do not want to pay off your mortgage only to put your house up for collateral when an unforeseen event happens. Life insurance: Do you currently have life insurance? If so, is it enough coverage to keep your family from undergoing financial hardships when you pass, especially if you are the primary bread winner. Interest deduction. Paying a mortgage has its benefits when it comes to your income taxes. You receive a tax break based on the amount of interest you pay on your mortgage. If you are in the 25-percent tax bracket and you paid $24,000 in mortgage interest this year, you will be giving up a $6,000 tax break if you pay off your mortgage. Limited liquidity. We all know that selling a home is a long process. If you decide to move or have a medical emergency you may want to have liquid assets, or money, that is easily available to you. You could take the excess money you would use to pay your mortgage and put it in a liquid investment. You can still make money on your investments and still be able to liquidate them much easier than you would a house. Saving habits: If you choose to pay off a mortgage early, what would you do with the money you would have used to pay your monthly mortgage? If you don’t invest or save it, and just spend it, you are not benefiting yourself financially. This was originally published on Monday, May 9 ,2016 in the Pacific Daily News. Click here to subscribe to the PDN. Q: My father is terminally ill and I am in the process of getting his affairs in order. He has an updated will and I have confirmed that my mother is named as his beneficiary for his life insurance and retirement plan. My main concern is his debt. He took out a large loan several years to help with his medical treatments. He is not behind on his payments but I am curious to what happens to the debt once he passes. Could you help me understand how debt is paid off once the lean holder is deceased? A: I am so sorry to hear about your father’s illness. As a child it is hard having to switch roles and become the caretaker for our parents. Unfortunately, when someone dies, their debt does not disappear. The rules to creditors recouping their money is complex and often vary from state to state. Of course, it also depends on the type of loan and if there are others who share the responsibility. Family members typically are not obligated to pay off the debt of a deceased family member directly from their assets. The Fair Debt Collection Practices Act (FDCPA) protects family members from unfair, deceptive, or abusive practices used to collect a debt. Who is responsible? Take a look at who signed for the debt. If it is a joint debt, then two or more people are responsible for the full debt. The names of those responsible will appear on the promissory note, loan or credit agreement. Usually there is a clause in the contract that if something should happen to one of the responsible parties and they are unable to pay their portion then the surviving debtor(s) are responsible to pay off the full amount. If only one person owns the debt, then that person is responsible for that debt. If the estate, the total net worth of an individual that includes land, possessions, cash, and other assets, of the deceased doesn’t have enough money to cover the debt, the debt may go unpaid. If the estate has money, then the assets from the estate will be used to pay off the debt. Depending on what type of debt the deceased leaves behind will also determine if the debt will be repaid. Credit card. If the credit card is joint with someone else or has a cosigner(s) then the cosigner(s) are responsible for paying off the debt. Otherwise depending on the amount left the credit card company may pursue collecting what is due. Mortgage. If you are inheriting a house with a mortgage you will inherit the debt as well. If you cannot make the payments, you may have to sell the home. If you are having trouble paying the mortgage, it could affect your credit score if your name is on the note secured by the mortgage. Medical. Medical expenses are usually on top of the priority list to of debts to pay. Taxes. If your loved one passed and left unpaid property or income taxes, the estate will be responsible to pay them. They too can put a lien on assets till the debt is paid off. The deceased will be responsible to pay any income tax on income earned during the year of their death. Michael Camacho is president and chief executive officer of Personal Finance Center. He has more than 20 years of experience in retail banking and at financial institutions in Guam and Hawaii. 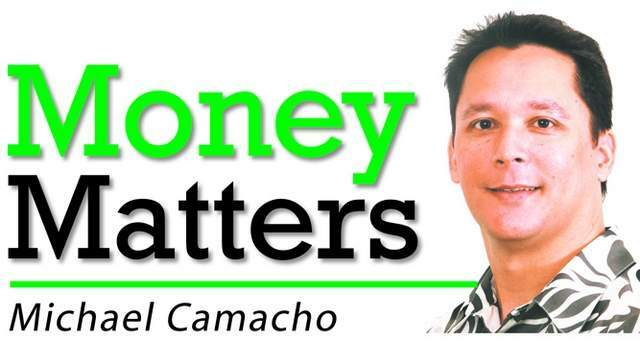 If there is a topic you’d like Michael to cover, please email him at moneymattersguam@yahoo .com and read past columns at the Money Matters blog at www.moneymattersguam .wordpress.com. This was originally published on Monday, February 9, 2016, in the Pacific Daily News. Click here to subscribe to the PDN. One thing we all have in common is there will be a point in our lives where we will no longer be able to work and will have to start our retirement. Having good habits today will help secure our future. Life insurance. “Eighty-five percent of the best retirement savers had at least $100,000 in life insurance coverage,” a March 2015 CNBC.com article stated. Talk to your insurance company on which is best for you, whole-life or term-life insurance. Either way, you want to be sure that you are covered in case you become ill, incapacitated or pass away. You do not want to use your retirement money to cover these expenses. Diversify. Mix up your investments that fit your risk tolerance. Those who are further away from retirement can capitalize in riskier investments than those who are closer to retirement. Having your investment in one type of investment is risky. Don’t put all your nest eggs in one basket. Deciding what to invest in may require some professional help. Retirement at a dollar amount. When asked the question, “When do you want to retire?” many of us reply with an age. Sometimes we are not ready to retire exactly at 65. Your retirement is about freedom and it would be great to say, “I retired as a millionaire.” Know exactly how much you need to retire comfortably. Focus on the long term. We put a lot into our retirement investments, and it is hard not to feel some anxiety when we see the market go on a decline. It is important not to panic and do something that you will regret later. Many investors see a dip in the market as an opportunity to acquire more equities at a lower price. Simple investing. You do not need an expensive and complicated investment portfolio to earn a lot of money. In fact, many of those expensive investment plans come with large investment costs. Those investment costs can reduce the amount of money in your nest egg. Estate planning. If you own real estate, you should have a living trust that ensures certain people get the assets you want to pass on to them. You should also have documents stating whom you designate as your medical caregiver in case of an emergency. These should be reviewed on a yearly basis. Review regularly. Take a look at your retirement plan every six months or yearly. Keep track of how your investment is performing. Be adaptive and recognize that the markets change. As your life changes so do your retirement goals. Ask yourself, “Am I contributing enough?” When you re-enroll, take a look at your plan and strategy. Do they still meet your needs? If you see that your portfolio is constantly trending downward, talk to your adviser. Stay healthy. Your health when you retire is important. As we age, health care becomes more expensive. If you retire in good health, it is likely that your medical costs will stay low and you can enjoy that retirement money. Never stop learning. Never stop learning about investing and personal finance. The more you know, the more you can prepare for the future. Professional help. Something as important as retirement should not be left up to guessing. Hire a professional. Taxes, bonds, stocks and other investments are complicated. Policies and laws can change, and you need someone who is knowledgeable. Don’t be afraid to ask your adviser questions. You should be able to trust your adviser and the decisions made. This was originally published on Monday, December 28, 2015, in the Pacific Daily News. Click here to subscribe to the PDN. In just a few days we will be ringing in 2016. In following tradition, many of us take this time to reflect on the years past and create New Year’s resolutions. Whether your financial situation was enhanced or looked bleak in 2015, the start of the year is the perfect time to create your financial New Year’s resolution. In the past few weeks, I’ve discussed what areas to review before the year’s end. Take what you have discovered and create your financial goals for 2016. Pay down debt. This is probably the most popular personal finance goal. Challenge yourself to pay off your debt. It takes some work but in the end, it’s worth it. The longer you have the debt the more you pay on interest. Paying more than the monthly minimum payment will greatly reduce how much interest you pay. For example, if you have a $5,000 balance with a 13% interest rate and $100 monthly minimum payment, it will take you 6 years and 1 month to pay off your debt and you would have paid $2,241 in interest. If you increase the payment to $150 a month, it will take you 3 1/2 years to pay off your debt and you would pay $1,237 on interest. You would pay off your debt in half the time and save yourself about $1,000. There are free credit card repayment calculators online to help you compute how long it will take you to pay off your debt and how much interest you will pay. Emergency fund. Because life never goes as planned, it’s a good idea to create an emergency fund. A general rule is to have in savings at least 3 to 6 months of income. Keep this fund separate from your regular checking and savings account. Unexpected events such as a job loss, medical emergencies, and car repairs can be stressful and costly. An emergency fund will create a safety net that will reduce the need to use a high interest credit card. Retirement planning. No matter how old you are, it’s inevitable that one day you will retire. If your employer has a 401K plan, consider signing up. If you received a raise this year, consider putting a percentage of your raise into your account, especially if your employer matches your contributions. If you are already contributing your maximum, you may want to think about getting a second fund. Estate planning and will. No one likes to think of the worst case scenario, but being prepared for it helps those you leave behind. Whether you’re single or married with children, you want to be sure that your final wishes are met. You may want to include a living will and powers of attorney. Life insurance. If your employer offers a life insurance policy, you should consider joining. If you reviewed your life insurance policy and found that you can increase your policy, you should do so. It’s worth a little more to ensure that your loved ones are financially fit when you pass. Compare insurance. Ask your insurance company if they can offer a better deal on the same coverage. Inquire about discounts. Explore the competitors and see if they can offer a better deal. If you’re not bundling with the same insurance company, you may want to reconsider. Bundling your insurance can save your money. Save, save, save. If you are planning on making a large purchase or planning a large event, try not to put the majority of the cost on a high interest credit card. Start saving ahead of time. Create savings accounts for each occasion and put in a little amount every payday. Eventually it will grow, and it will save you from paying more. Money Matters was started in February 2011 and almost five years later, I still get great feedback on the column. Thank you so much for being loyal readers. I am honored that I can help readers achieve their financial goals. The goal of this column is to get you thinking of your financial well-being as much as you think about other things on a daily basis. I wish everyone a Happy New Year, and I hope that 2016 brings you many blessings. This was originally published on Monday, December 8, 2014, in the Pacific Daily News. Click here to subscribe to the PDN. As the year comes to an end, it is time to reflect on what has occurred over the past 12 months. This should include your finances as well. By reviewing your finances, you can prepare your New Year’s goals. One of the items on your review checklist should be your insurance policies. Many of us let our policies go on autopilot and let them automatically renew. Your life situation changes throughout the year and your insurance needs will, too. Take some time and review if your policies still cover your needs. • One of the most important facets of life insurance is your beneficiary. If you went through a divorce or added a new family member, you may want to change your beneficiaries. If a beneficiary passed away, you need to name a new one. • Have your needs changed? By reviewing your policy, you may have decided that you need to increase or decrease your policy. • Has your health changed? Has your health improved? Did you stop smoking or loose a significant amount of weight? Or has your health declined? Changes in your health can have a profound effect on the cost of your insurance. Check with your insurance company if a physical is needed before making any changes. • Does the amount of insurance cover your needs? If your coverage is inadequate, you may need to increase your policy or buy a new one. If your coverage exceeds what you need, you may want to realign your policy by decreasing it or adding a new beneficiary. • Is your life insurance and estate plan integrated? If you modified your estate plan recently, ensure that your life insurance has been included. You want to ensure that your estate and life insurance do not have gaps. Gaps between the two may cause benefits from your life insurance to cover estate taxes and not go to your beneficiaries. • Who is covered? Did you add a new driver, maybe by marriage, or your child recently obtained a driver’s license? Maybe you removed a driver after a divorce or your child has left home. • Are all your vehicles covered? Did you recently sell or buy a new car? If you sold your vehicle, remove it from your policy. If your vehicle is getting up in years, you may not need the same amount of insurance. • Are you familiar with your claims process? What are you supposed to do right after an accident? How long do you have to file a claim? Do you know how much your deductible is? Some insurance companies have apps for your smartphone to file claims. • Did your income change? If you are making more money, you may want to consider increasing your coverage and vice versa. • Do you qualify for a discount? If you haven’t had a recent accident, you retired, installed an anti-theft system, or if your teen driver earned good grades, you may qualify for a discount. Talk to your insurance agent/broker about the discounts they offer. You may be surprised just how much you can save. • Do you need all the coverage for which you are paying? Maybe you want to purchase additional coverage such as typhoon, rental car or roadside assistance. All your insurance policies should be reviewed to check if you are getting the best coverage and rates. Bundling policies will give you a significant discount. You may want to compare prices of other companies to get the best coverage. This was originally published on Monday,June 16, 2014, in the Pacific Daily News. Click here to subscribe to the PDN. Question: I recently went to a funeral for my friend who had been ill for a while. After talking to some of her family members, I found out that she did not leave any direction for her funeral arrangement and worse, no will. Now her children are fighting over her personal belongings, property and finances. My parents are getting up in age and I do not want my family to go through what my friend is dealing with. What can I do to help my parents prepare for their passing? Answer: My condolences on the loss of your friend, it is never easy saying goodbye to a loved one. It is even harder to see family members torn apart at a time when they should be uniting and consoling each other. Unfortunately, this happens way too often. Many of these arguments can be alleviated if the family member gets their estate in order before passing. • Life insurance: First, do they have life insurance? If so, does their life insurance cover funeral and burial costs? If not, it is never too late to get an affordable life insurance plan or to add additional coverage to their existing plan. Sometimes life insurance can be delayed and you have to pay out of pocket for the funeral. This can be difficult, especially if you and your family are sharing costs and accurate record keeping is not kept for reimbursement. • Funeral arrangements: This might not be easy, but sit down with your family and parents and discuss what your parents want at their funeral. This will give you some idea of how much it will cost. Do your parents want to be buried? If so, do they have burial plots? Where do they want to be buried? Maybe they may want to be cremated instead. Having your family around and taking precise notes of their requests will help alleviate arguments later because everybody will have knowledge about what your parents want. If one of your parents is a veteran, you can try the Veterans Affairs for assistance. • Estate planning: Most people think that only the wealthy need to have an estate plan. That is not true. Whether it is to divide a 401(k), real estate or other types of assets, an estate plan is necessary. Having an estate plan will reduce the confusion of your parents’ final wishes, give their heirs a piece of mind on who receives your property and assets, and will minimize taxes and legal expenses. If you pass without an estate plan, your loved ones may not receive your assets. The government could keep the assets and you do not get to decide how your property is divided. These few steps could help lessen the stress that comes from losing a loved one and hopefully any arguments over what is inherited and who inherits it.